Support and Raise Awareness of the Importance of Being Gas Safe beginning with Gas Safety Week 17-23 September 2018! In a recent case, the HSE investigated a Plymouth landlord after gas appliances at his rental property was found to be ‘Immediately Dangerous’. The landlord had failed to ever have gas appliances checked for safety at his rental property. In addition, he had arranged for an unidentified person to make alterations to a gas boiler flue and that person had left it in an extremely dangerous state. The landlord pleaded guilty to breaching the Gas Safety (Installation and Use) Regulations 1998. He was sentenced to 15 months imprisonment, suspended for 24 months and ordered to pay costs of £4,904. This case is a reminder to landlords to make sure they only use installers on the Gas Safe Register and that gas appliances at tenanted properties must be checked for safety on an annual basis. Stuarts Property Services are proud members of NALS (National Approved Letting Scheme) will again be supporting Gas Safety Week which runs from 17-23 September 2018. The eighth annual Gas Safety Week sees organisations from across the UK work together to raise awareness of the dangers of poorly maintained gas appliances, which can cause gas leaks, fires, explosions and carbon monoxide (CO) poisoning. All landlords and housing associations are legally obliged to ensure that all gas appliances and related pipes and flues within their rental properties are checked every 12 months for safety. They must issue a copy of the certificate to the tenant within 28 days of the test and give a copy to any new tenants moving in. 4. We at Stuarts only ever use engineers who are GAS SAFE REGISTERED ENGINEERS e and qualified to work on house hold gas appliances. 5. Properties* that have Carbon Monoxide present we make sure a Carbon Monoxide Detector is fitted in the property. By taking care of your gas appliances properly you are taking care of your home, your tenants and your loved ones. Follow these few simple checks to keep you and your family safe. Check any gas appliances you own every year. 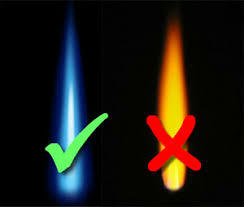 Gas appliances should be safety checked once a year and serviced regularly by a Gas Safe registered engineer. Set a reminder so you don’t forget. Check your engineer is Gas Safe registered. You can find or check an engineer at https://www.gassaferegister.co.uk/find-an-engineer/ or call 0800 408 5500.